College of Criminal Justice Education of the Western Mindanao State University held their 14th Criminology Intern Commencement Exercises. Ninety-one police interns were pronounced graduates last 18th of March at the College of Education’s Social hall in the university. Senior students of Manindigan Class 2011 completed the course requirements and were proclaimed graduates by Vice President for Academic Affairs, Dr. Felicitas F. Falcatan. 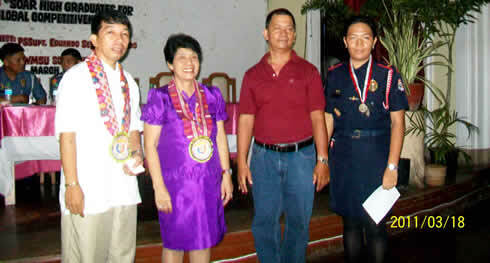 Falcatan initiated the acceptance and confirmation of the Criminology Intern graduates. College of Criminal Justice Education Dean, Prof. Effrendy M. Estipona assisted Dr. Falcatan in the awarding of certificates and awards. During the event, CCJE also took the opportunity to recognize students with outstanding performances in academics, leadership, service and athletics. Meanwhile, Police Senior Superintendent Eduardo Serapio Garado, Maritime Police Regional Chief was the guest speaker during the event.